It was such a nice day today, too nice to spend inside. On the spur of the moment (out of my comfort zone but in keeping with the theme of this post) I made a decision we all get showered and in the car and head off for a visit. I phoned to make sure we would not arrive at an empty house, and all was set. We stopped on the way to grab some afternoon tea and continued our leisurely drive through the scenic route. An hour later we arrived and guess what was waiting for us? 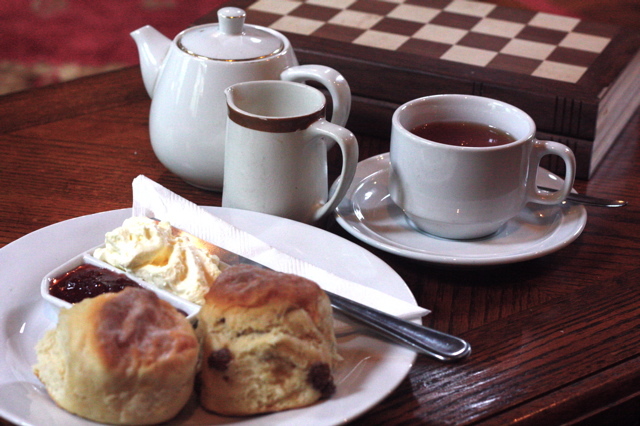 Nothing says comfort, old friends and welcome, like a home made Devonshire tea! Scones still warm from the oven. After a bit of catching up, LJ was off outside to visit the dogs and play basketball and I was able to take some time to sit and enjoy a moment of adult company (rare for me). The perfect afternoon, sharing the conversation of a life long friend, accompanied by hot scones with jam and cream and a good strong cup of tea, what more does a girl need? Today I am grateful for scones. What food really brings you comfort? What does comfort food mean to you? Do you like to share your comfort food or eat alone?